For three decades, this Golkar Party politician served as President of Indonesia. Earlier in his life, he was the Indonesian Army's Chief of Staff and the Secretary General of Indonesia's Non-Aligned Movement. At the age of nineteen, he began his military career as a member of the Royal Netherlands East Indies Army. 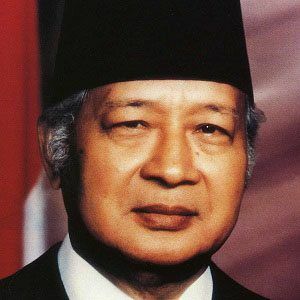 Though the Indonesian economy grew tremendously under Suharto's administration, so, too, did high-level government corruption. The child of Javanese peasant parents, he grew up in a largely unstable environment, though he found some semblance of a family life while in the care of his brother-in-law and older sister. In his mid-twenties, he married Siti Hartinah; the couple raised seven children. Suharto instituted his "New Order" after orchestrating the overthrow of first Indonesian President Sukarno.